I had many different experiences and emotions throughout the day after being chosen to be a translator for Spanish speakers at the gift-giving station at the Without Walls Christmas Party. At varying points in the day, I felt: happy, fulfilling and grateful, while at other times I felt frustrated and shocked. I heard a number of racist comments towards the guests that left me very unsettled. While at the station, some of the volunteers pointed out certain individuals because of the way they dressed or portrayed themselves. The volunteers reminded us to keep an eye on them and make sure they weren’t stealing. I was uncomfortable listening to the volunteers make assumptions and comments because of the way the guests looked. I noticed that most of the guests were people of color. This highlighted the systemic and institutional racial problems that our society faces at this moment in time. A comment that made me particularly upset was “Watch out for that man. He’s a Crackhead.” This opened my eyes to the inequalities that people of color may face daily. Although there were negative and uncomfortable situations throughout the day, it was mostly filled with positive, uplifting, and grateful vibes. The racially insensitive comment that the volunteer made really stuck with me. I feel motivated to take action and have productive discussions throughout the rest of the week about racism and social injustices. 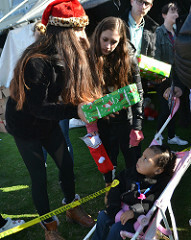 I was grateful to be able to give these kids the opportunity to receive a present that they may have not gotten if it wasn’t for this incredible event.